This is where you can flick through the pages of our previous programme and chose your preferred page for your advert to be shown. 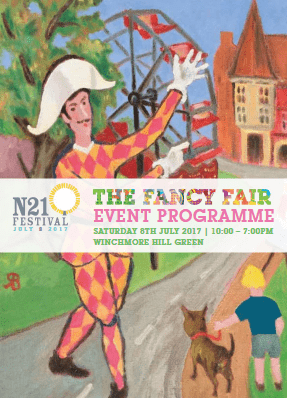 The Fancy Fair Festival 48-page programme will have 20,000 printed in A5 format as a full color quality programme, these will be distributed directly into homeowners’ letterboxes just before the Festival but to twice the number of N21 postcode households as last year’s event. This will advise householders in detail of the forthcoming Festival and put your message straight into these important future customers hands, the programme would be expected to be read by 60,000 readers, a massive footprint for our sponsors and advertisers. The cost of direct leafleting to these 20,000 homes would exceed £2,000, a full-page advert in the programme represents great value apart from the value to your company in being seen to actively support our great free Community Event and to be part of North London biggest day out. Printers finished proof sizes below make in CMYK add 3 mm bleed and supply in a finished PDF form your designer will know all about this, we need finished proof copies by the deadline of 1st May. We estimate at least 60,000 residents will read the programme and keep it safely for the big day, please support our Festival by advertising your business and being part of the day just click on the link to book your space. If you wish to pay by BACS. 1.Final proof copy due date will be by the 1st May 2019 in the format as shown in the booking form the booking may be cancelled without refund if the final proof has not been received by this due date. 2.Whilst every care will be taken to place advertisers copy on their preferred page the organisers retain the right to make last minute amendments to page positioning if and where necessary. 3.The Organisers retain the right to decline any advertising proof for any reason they see fit and a full refund would be made in this instant their decision is full and final.